What a wonderful county Somerset is. I moved here with my family over 20 years ago after living all my life in the Big Smoke otherwise known as London for 45 years. The 17th century diarist Samuel Pepys once wrote “When a man is tired of London, he is tired of life”, however I am not so certain he would have come to the same conclusion if he lived there today. In Samuel Pepys day, London still comprised the two small cities of Westminster and London with fields in-between and with a population of only about 250,000. Today London and its suburbs measure about 40 miles across East to West with a population of just over 7.5 million and matching horrendous traffic. The outer London suburban street we lived in was originally highly sought after by house buyers. It was a street where most people knew each other with a friendly atmosphere pervading the local environment. I suppose like many places, with the passing of the years, people either died or moved on, car parking and consequential ensuing traffic problems grew. These coupled together with an increasing population all led to the gradual deterioration and erosion of harmonious relations. It was almost possible to feel growing tensions as neighbours with more than one car per household vied for increasingly limited parking. Eventually neighbourly knowledge and friendship became limited to adjoining households or less. It was not long before the Local Authority stepped in with managed traffic schemes coupled with the usual promises of “free parking” outside your own house, only to be rapidly replaced by ever-increasing priced parking permits. The local authorities always overlook that parking outside ones home was always free anyway before their intervention. I always recall of experiments I once read on social harmony. Scientists found rats living in a colony under controlled conditions are quite sociable creatures. However the scientists gradually increased the number of rats within the colony without increasing its physical size. The scientists found that as with many human conurbation’s, as population size grows within the same environmental area, social harmony rapidly breaks down. Sometimes I find it possible to get a clearer perspective of potential problems by standing outside of the problem and viewing it as an onlooker. It was not difficult to see that the already lost sociable harmonious environment I originally knew, could only continue to deteriorate with the passage of time. It was clear to my wife and I that it was time to leave the London I had known since my birth. The West Country, renown for its myths and legends, is an area we know well and where we have many friends. Rural Somerset being an area that particularly appealed to us. One of the problems in moving home is not only selling your own house but also finding one that suits your own particular requirements. We did not want to live in an estate type property but rather an individualistic property in both character and style. It was hard to be specific what we were looking for, we just knew we would know the property when we saw it. Estate agents can only advise buyers of the properties they have on their books at the time. We also knew that if we chose a property we were not completely happy with it is much more difficult to move yet again. In the end my wife and I spent 18 months house hunting travelling between London and Somerset before we found our ideal home. It was a long task but well worth it. Work wise, I had already worked out the feasibility of commuting to London on a daily basis and found it more than possible and practicable. Although work colleagues kept advising it could not be done, I knew it could and surprised them all by eventually doing so. One of the problems of living in London is that minds become rapidly attuned to traffic conditions and consequent travel difficulties. On occasions, it can take several hours to drive only a few miles and consequently the mind seems to incorrectly accept that travelling any sizeable distance will be at the same slow pace. Very often it is people’s own minds that stop them moving from London rather than any practicable obstacles. It may seem strange but I found many of my work colleagues spent longer behind the wheel driving to and fro every day than I did catching a train direct into Central London. I still recall the day we first arrived at our new home. We had booked two weeks holiday to give us time to settle in and as we opened our front door for the first time, we were welcomed by a plethora of greetings cards on the mat from neighbours throughout the village and who as yet we did not know. The village itself is only slightly larger than a hamlet with about 50 properties and the local geography dictates it cannot grow larger. With a population of just over 0.5 million for the entire county of Somerset, overcrowding is never and issue. My wife was also fortunate in finding new employment as she is a highly qualified operating theatre scrub nurse with many years of experience in all types of surgery. A few weeks before we moved she saw an advert in the Nursing Times for a theatre nurse in a local district hospital. A scrub nurse is the person who ensures that patients do not go home with the hospital cutlery still inside them as well as being the person responsible for handing the correct medical instruments to the surgeon. She applied for the position and was accepted for an interview which took place on the day after we arrived. There were many applicants for the position but fortunately my wife’s knowledge and experience must have shone out like a beacon. That afternoon we received our first call on our newly installed telephone. It was the hospital administrators advising her that she had won the position hands down and also enquiring how soon she could start. The hospital really was desperate for a qualified and experienced theatre nurse. Traffic in Somerset is normally light and road connections good. The speed limit on most roads is 60 mph with a few 70 mph making for easy travel within Somerset and the surrounding counties. In practice this means that within a 10 minute drive, we can travel anywhere within a 20 mile radius or a 40 mile radius within 20 minutes. The Jurassic Coast, North Somerset coast, Exmoor and The Quantocks, Glastonbury all are within easy reach. Both Glastonbury Tor and Cadbury Castle can be viewed from our home. 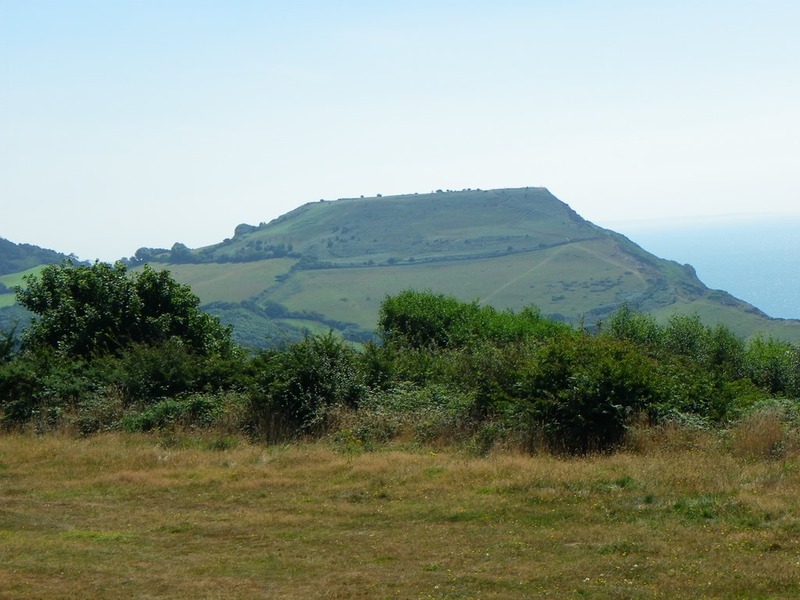 Cadbury Castle is one of the legendary locations for King Arthur and Camelot. Although no such location has ever been established in fact, with a River Cam flowing nearby and with nearby villages with exotic names like Queen Camel and West Camel, Camel-ot does not seem to be a too far-fetched possibility. In practice it means we are able to travel to more supermarkets, cinemas, theatres, beauty spots, interesting locations or any other facility we require than we could in London and in a fraction of the time. There is no frustration either caused through bottlenecks or traffic jams. If I were looking for an analogy to compare countryside living, I would suggest trying to recall one of those few perfect days we all have in our lives. The sort where one goes for a countryside picnic, the seaside or whatever. The only blight on the day is that we have to come home. To us, everyday is now like one of those perfect days with the exception that we do not have to journey home again. On the social side, we now have many more good friends than we are likely to have made if we remained in London plus all the numerous countryside activities that go on throughout the year. The old saying that one of the loneliest locations in England is Piccadilly Circus certainly appears to ring true. I wonder what Samuel Pepys would say about London if he were alive today. As I said at the beginning, What a wonderful county Somerset is.